Rome is one of the most photogenic cities I have visited. It is a living museum with a rich history that is juxtaposed with a modern city that offers all of today’s technological amenities. It is a city with charisma that is equally matched by its residents. 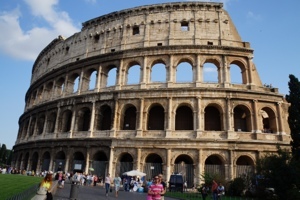 To sum it up, Rome is a perfect marriage of history, charming people and good food. I literally gasped the first time I saw the Colosseum. As it stood there in all its grandeur I couldn’t help but be taken aback by what a marvel this structure is – particularly for its time. A sense of accomplishment also came over me. I had always dreamed of one day seeing the places like the Colosseum that I had studied in history class, and I had a made that happen. Anyone visiting Rome should visit the highlights like the Trevi Fountain, Roman Forum and Pantheon, but all you really have to do is just look upwards and outwards, because the city itself is a wealth of beauty and history. When I die I want to come back as a Roman woman. Their svelte figures and stylish wardrobe make them enviable. I would sit in cafes and look on in adoration at the outfits they had put together and wonder if I too could pull of these looks. I would also ponder whether these fabulous women were actually eating the pasta and pizza that were causing my waistline to expand by the day. The men of Italy are a whole other story. I thought men this romantic and charming were an urban legend of sorts. It might all seem cheesey if they weren’t so sincere. No, Toto we are not in San Francisco anymore (or the rest of the U.S. for that matter). It is not often a woman can say someone recited Shakespeare to her. Yes, for just a moment I got to be Juliet in my own life’s play. At this point I surely have carb toxicity. The shear quantity of pasta and pizza I have eaten is astounding, but after all that is part of the reason I have always wanted to visit Italy. The pizza in Rome had some of the thinnest crust I have ever had the pleasure of eating. Somehow it manages to bear the weight of all the tasty toppings like buffalo mozzarella, cherry tomatoes and spicy salami. Nearly, once a day I would devour one of these tasty pies. It is not a sustainable lifestyle, but for my time in Rome it was the one I chose. Even a pizza feign like me couldn’t deny myself the opportunities to try the fresh pasta. After having the real stuff it seems like a sin to ever have pasta out of a box again. In just four days Rome put a spell on me that every city after will have to try to live up to.